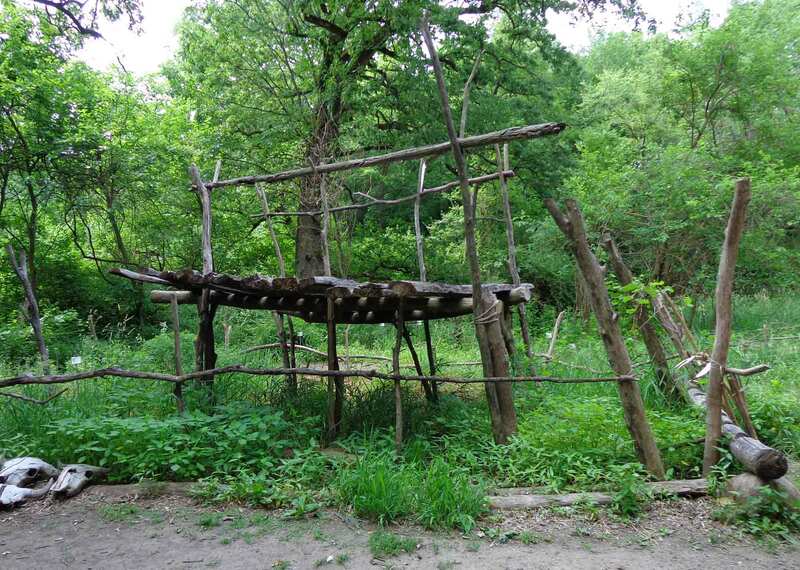 In addition to the foods the Ioway grew, there were a lot of plants they gathered in the woods, such as mushrooms, nuts, and berries. In addition, the area had a lot of game, so deer, turkey, raccoon, elk, or turtle might turn up on the menu. The Ioway had begun trading with French trappers and traders in 1676, which brought into their lives items made of metal and glass. 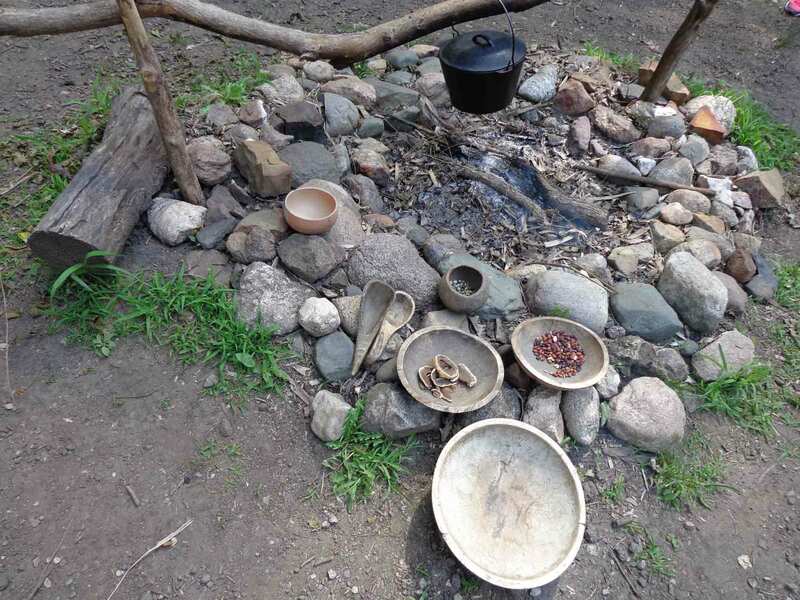 Metal pots, like the one hanging over the fire, expanded their options for cooking. However, traditional wooden utensils were still used for eating and most food preparation. 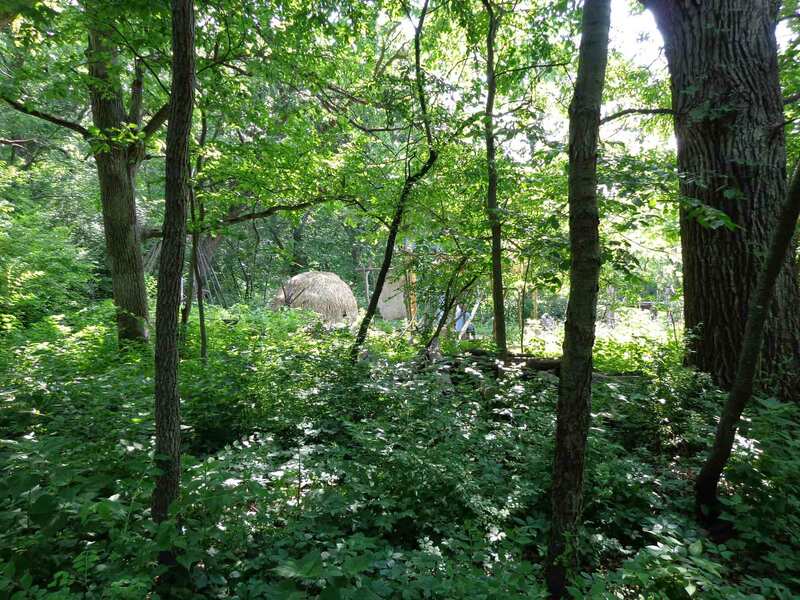 Approaching through the woods, one comes first upon the Ioway Indian camp. Like many Native Americans across North America, the Ioway Indians raised corn (maize), beans, and squash. Also like other Native American groups, it was the women who raised the crops. Men did the hunting and fought battles. An enthusiastic interpreter related that corn was first planted in this area around ad 900-1000. 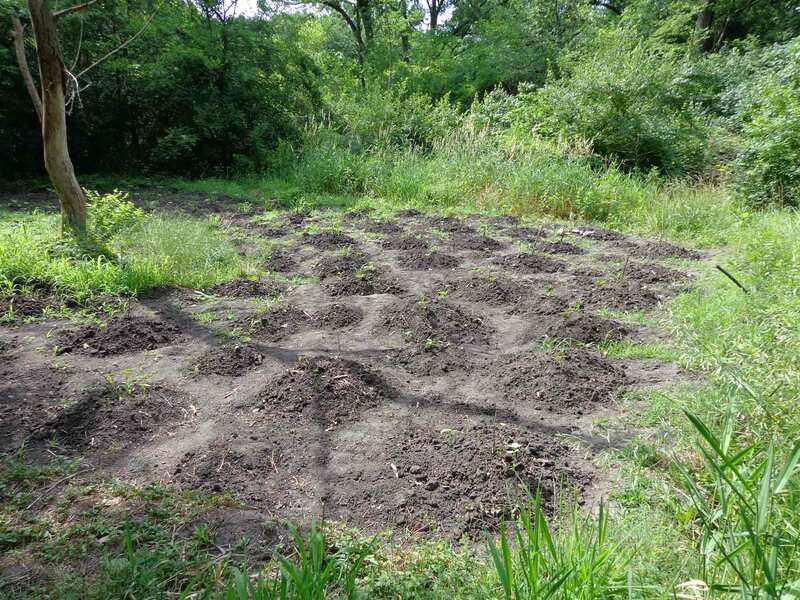 She described the way corn, beans, and squash were grown together and pointed out the mounds nearby. 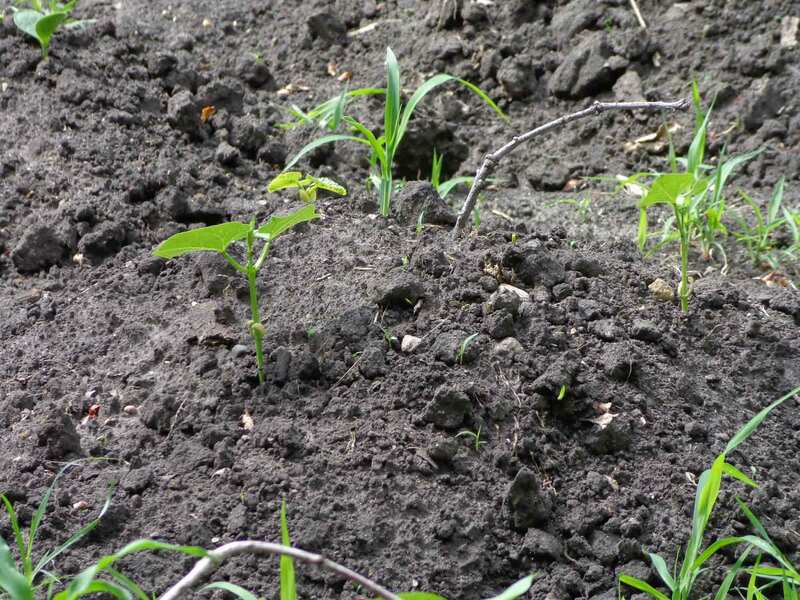 By planting the seeds in mounds, it kept plants far enough apart, to keep the tall corn stalks from shading other plants nearby—the same reason corn is planted in rows today—to let sun reach the leaves. In this case, however, sun was needed for the squash and beans, as well, and not just the corn plants. The first shoots of both corn and squash plants were pushing their way through the soil at the top of each of the mounds. I consider the origins of words to be an important part of history—but also fascinating and fun in their own right. So before we head off to the farms, I thought I’d offer this little bit of nomenclature and how it arose. 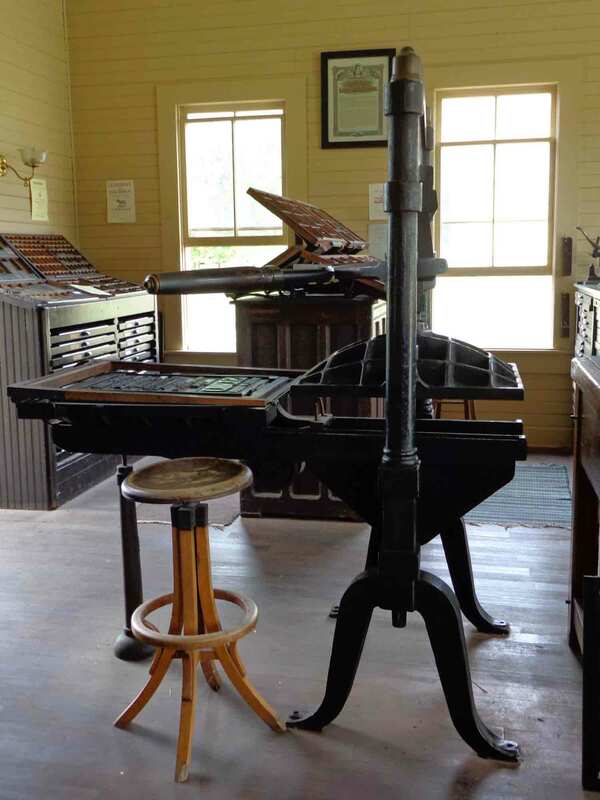 A hundred years ago, if you wanted to print something, you had to set type. (There are still places this is done, but there were no other options back then.) Each letter had to be set by hand. Printing was done on a press that looked like this. 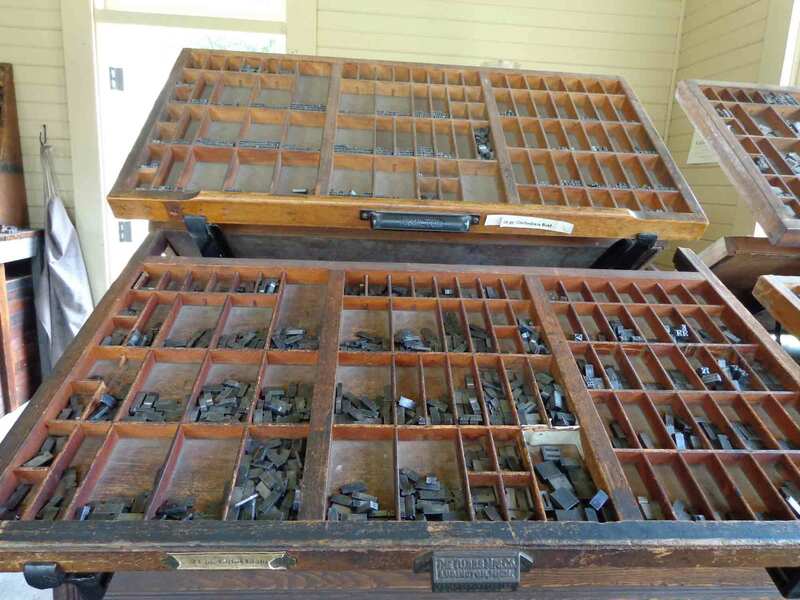 The typesetter would place type in a frame that would keep all the letters in place. Type was made of lead, which is why even with computers, people speak of “leading”—that extra bit of lead one would add to create more space between lines on the page. The typesetter would keep all the letters close at hand, in cases like these. The type for capitals, or upper case letters was needed less often than the type for lower case letters—and that contributed to how we got these terms for the different types of letters. The letters one needed more often were kept in the lower of the two cases, and the capital letters were in the farther, slightly harder to reach upper case. 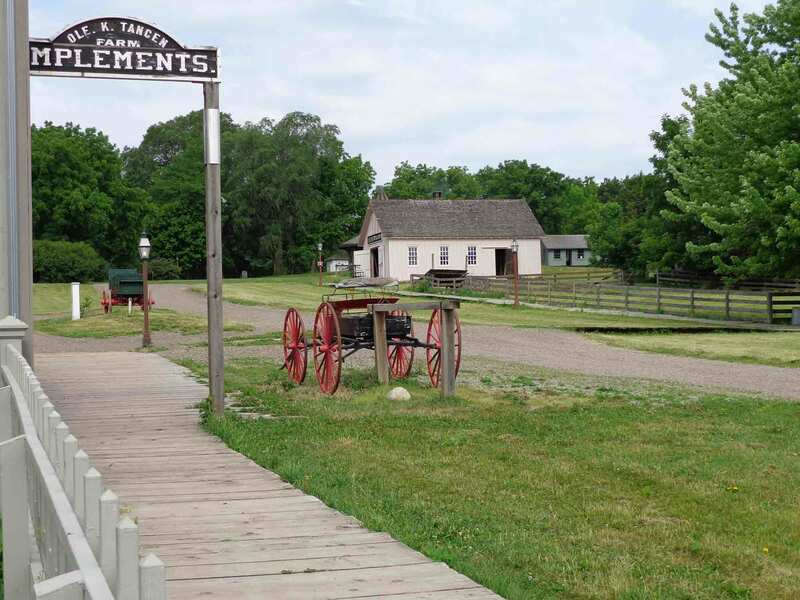 I would, over the course of my research, interview farmers in Iowa, but my first destination was an outdoor museum, the Living History Farms in Urbandale, IA, near Des Moines. I love history, and this turned out to be a particularly good place to indulge that passion. The interpreters/re-eneactors were all amazingly knowledgeable and the set-up was brilliant. One first enters first the “town” of Walnut Hill. From there, it’s a short tractor ride to the beginning of the trail that leads to the various farms. Each farm (defined by era: 1700, 1850, 1900) is sufficiently far from the others that you can’t see any time period other than the one you’re in. 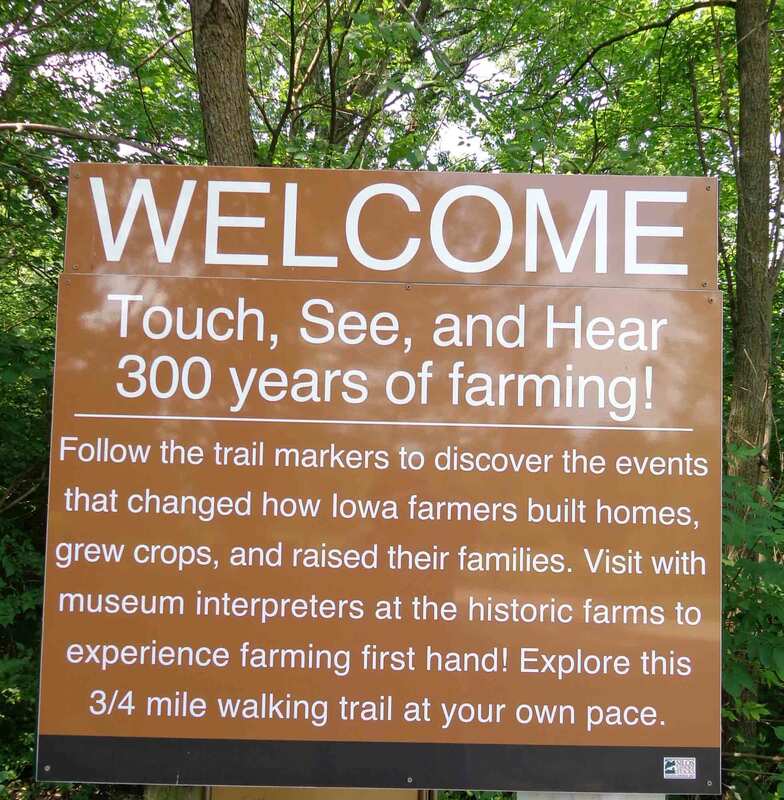 Between farm eras, the trail leads through hills and forest, where a handrail acts as a timeline, with dates posted and what is occurring in U.S. history between the dates of the three farms. This offers context to events in the region. I’ll have posts for each region, starting with Walnut Hill. Here, buildings, placards, and docents introduce the visitor to life in a small, Iowa town in 1875. There are houses, barns, a pharmacy, general store, bank, school, law office, millinery shop, church, cemetery, blacksmith (vital on the frontier, for making tools, shoeing horses, and repairing plows), cabinetmaker, a print shop (always a priority, since staying informed was considered so vital to the success of the young U.S.), doctor’s office, veterinary clinic, and broom maker—all the necessities. It’s a wonderful step back in time, and a delightful way to “experience” history. The townsfolk stress the connection between town and farms—one could not survive without the other. If you’re interested in visiting, you can learn more at http://www.lhf.org/. Here are a couple of photos I took in Walnut Hill. They only hint at all that is offered, but I think they capture a bit of the flavor. Lots of free parking along Walnut Hill’s main street. From Moline, I continued my journey westward, into Iowa. While all states in the Midwest are major corn producers, Iowa is number one. With no sprawling mega-metropolis, like Chicago and all the connected cities and suburbs (almost unbroken, from Gary, IN, to Milwaukee, WI), and no geographic interruptions, like the Sand Hills region of Nebraska, Iowa is pretty much farms from border to border. Sure, there are cities, but there’s nothing like the uninterrupted urban sweep on the shores of Lake Michigan. On the whole, it’s largely rural—so lots of corn. (Lots of pigs, too—they’re also number one for those.) So, writing a book on corn, I of course had to go to Iowa. Arriving in late afternoon left little time for work, so I settled into my hotel room and then called an acquaintance in town who knew I’d be visiting. Jean had sent me some info about the area and said she might have some contacts for me. She showed up with a few more brochures plus the name of a place for dinner—an Ecuadorian restaurant named Mi Patria. I’ve been to Ecuador, so I looked forward to checking this place out. As it turned out, it was excellent. We ordered the Mi Patria platter, which included roasted chicken, grilled marinated steak, pulled pork (possibly the best item on the plate), friend plantains, an interesting dish of pozole (hominy) and fava beans, rice with a fried egg, and stewed beans. Lots of excellent food for a reasonable price, and plenty of leftovers for Jean to take home. Back at the hotel, I went through information for onward travels. However, I needed to make it early night. I was feeling a bit unwell and hoped a good night’s sleep would fix that. 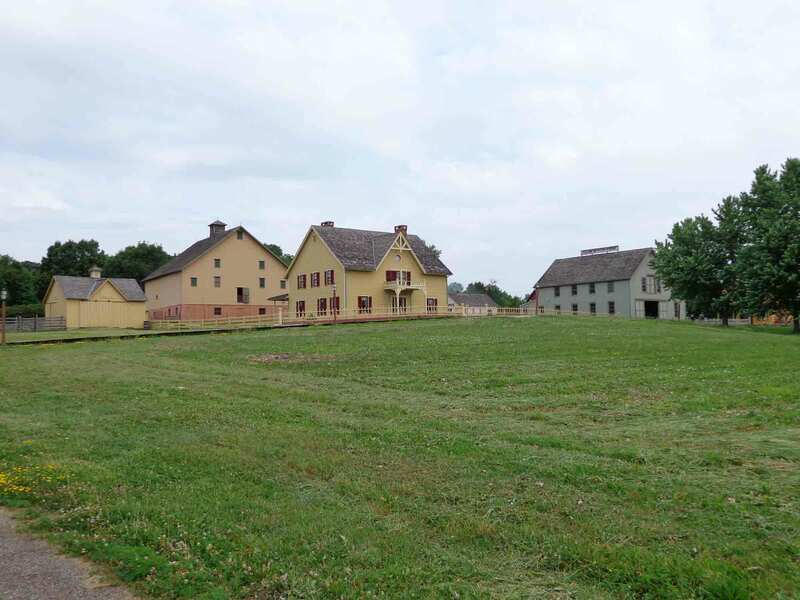 And tomorrow, the Living History Farms. After the tractor, the next big advance was the self-propelled combine—a harvesting machine that you drove, rather than dragging it behind a tractor. 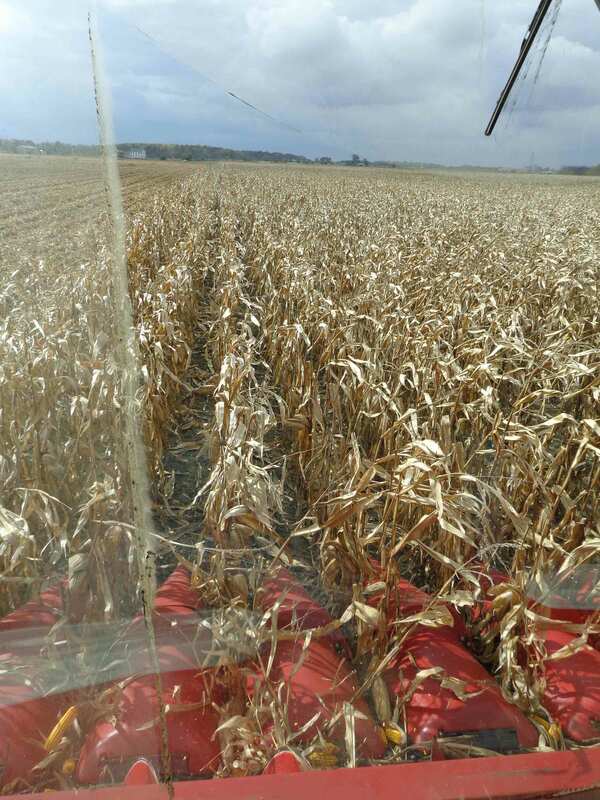 The modern combine looks more like a space station than a piece of farm equipment. 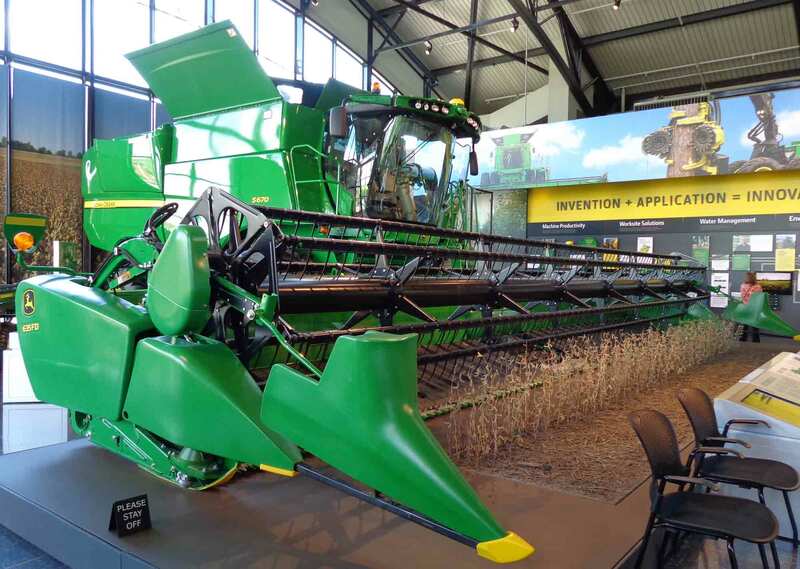 The combine on display at the Pavilion is fitted with a wheat head—a front end that harvests wheat. In 1954, John Deere introduced the first corn head—though combines then looked more like golf carts, and the corn head only harvested two rows at a time. Things have definitely changed since 1954.